Cook with greater precision by adding a kitchen scale from Kitchrics or Escali to your array of kitchen utensils. Using a scale means you can follow your favorite recipes more precisely and, if you're counting calories, can accurately measure how much you eat without the guesswork. These kitchen scales are styled to be an attractive addition to your kitchen décor, not detract from it. The sleek, stainless steel design of the Kitchrics digital scale makes it look like it's straight out of a professional kitchen. It measures in grams or ounces. The Escali Pico mini digital scale is small in size but measures up to 11 pounds or 5 kilograms and comes in four different colors to fit into your kitchen. 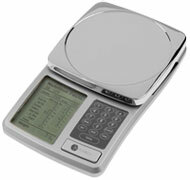 The Escali Aqua digital scale can be used to measure liquid ounces or milliliters, as well as weight. Put one of these precision kitchen scales to work in your home.